Organic Golden Flax Seed Meal is ground on cool mills which both preserves the healthful oils and increases bio-availability of nutrients. Very mild-flavored, sprinkle over just about any dish to add omega-3 fatty acids and fiber to your diet. Although flax seed meal contains all sorts of healthy components, it owes its primary healthy reputation to three of them: omega-3 essential fatty acids, lignans and fiber. Omega-3 essential fatty acids are good fats that have been shown to have heart-healthy effects. Two tablespoons of ground flax seed offers 2430 mg of omega-3s. Lignans have both plant estrogen and antioxidant qualities. Flax seed contains 75 to 80 times more lignans than other plant foods. Flax Seed Meal is high in dietary fiber containing both the soluble and insoluble types. It's also a powerful natural cholesterol controller. 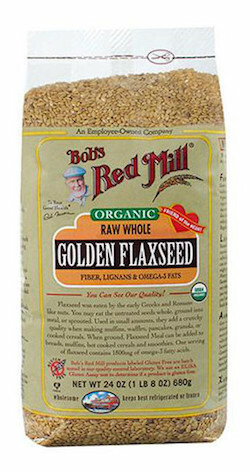 Organic Golden Flax Seed Meal is freshly milled to preserve the natural oils and nutrients. There is no nutritional difference between golden and brown flaxs eed meal.